Psypoke - View topic - Which fire starter was best? Which fire starter was best? Charmander, Cyndaquil, Torchic, Chimchar, or Tepig? Being a classic gamer, I prefer Charmander because it turns into the king of Pokemon, Charizard. Lol I also enjoyed Cyndaquil. Which did you prefer? Re: Which fire starter was best? Cyndaquil was always my bro but his movepool and base stats are less than perfect. Well, until HGSS, where you can set up quite a god of Typhlosions with Sunny Day, Flamethrower/Eruption, Extrasensory, Solarbeam... as a matter of fact when I did that I named him after Helios and he does not disappoint. I like Torchic and Combusken, but I don't like Blaziken so much. It looks almost inorganic, closer to a Digimon or a Palkia or something... But Combusken can't ice its cake of a moveset with Earthquake unless it evolves. Life ain't fair! I do not like Chimchar or its associates. Tepig is neat but still a let-down. "Fire/Fighting AGAIN!? WHY!" Right? Am I right? Ladies, am I right? 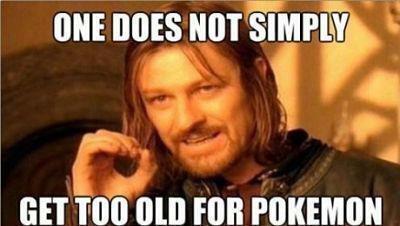 Even though I didn't ever have a Chimchar, I feel this way. I'm sure I've said this before, but I was really hoping it would gain the Electric type when it evolved, and would have a Tesla coil for a tail. Growing up to become Ganon isn't so bad though. So, all things considered... Cyndaquil. Yeh boyee. I agree 100 percent! Blazikin isn't worth my time. I hate the fire/ground. Cant stand it. Typlosion and Charizard are a tie for me. Fire/Ground? I wasn't aware Camerupt was a starter Pokemon. Most of what is considered the best is opinion. If you want to look at an overall standpoint from usefulness and all that, Blaziken and Infernape are by far the most useful. Typhlosion definitely does have his niche in Eruption, though, and Emboar's pretty sturdy. Charizard's just awful, though; the advent of Stealth Rock made him useless. As for my favorite? My first game was Gold and Cyndaquil was my best starter, so I have fond memories of Typhlosion. However, as far as battling purposes go, I'd pick Blaziken any day. Charizard was definitely not garbage. I could own a Blastoise 15 levels above my Charizard in Blue/Red. Blazikin could not beat him. In the anime Charizard beat Gary's Blastoise. I don't think Blazikin could do that. IN the gaaaaaaaaaaaames................... a Blaziken would probably have better odds for beating a Blastoise than a Charizard. STAB Fighting moves would do more for it than STAB Flying moves would for Charizard, given their base stats... Blastoise can pack Rock moves and could potentially have the Attack to back it up, which would destroy Charizard way more than the Water moves would. Both can use Solarbeam, and while most Blaziken would be trained to use physical attacks instead of special, Blaziken DOES have better potential in Special Attack than Charizard does... by one point. If you don't care what none of us say, that means you do care about what we say. Your sentence was a double negative. In addition, the anime does not follow logic. A Charizard would not be able to beat a Blastoise in a 1-on-1; it's just massively outclassed. Blaziken...he probably could. It'd be difficult since he has the inherent Water weakness, but he's got other things like Hi Jump Kick and such at his disposal. Any attack fired from a Blaziken will HURT. Also, this is the baddest Pokemon ever. Hey I'm from the south. That's how we talk where I come from. "Your sentence is a double-negative." Oh. Cool. We have the English Police over here. Stop finding little things to correct people on, and let me talk how I talk. Kay? Do you understand? Good. I'm also from the South. Mississippi. Deep south. Where I come from. "I"! Are you seriously starting a grammar debate, Nathan? You derail pretty fast. Away from Nathan's issues (this is one of, like, three threads where its like this) and back on topic. One that has only been mentioned once (Tepig) is certainly great. In Unova, it can beat (fully evolved) Lenora, Burgh, Brycen, and Grimsley. It can also do a number on Skyla's and Alder's teams. But, yes, and are equally good. I agree to disagree, to some extent. Cyndaquil will always conquer! This is just my favourite, not based stat wise. Charmander's line is overrated, but it's still my favorite. He has the same base stats as Cyndaquil, but with an extra STAB and bigger movepool. Plus, he gets Metal Claw to PWN rock types early game, and Iron Tail via TM later. And, he flies you places. Oh, and my fave starter ever is Mudkip. 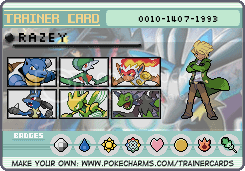 It's a tie for me with Charizard and Blaziken. Charizard is basically the undisputed champion of starters (99.999999% of the time) and then there's Blaziken. I don't get why everyone hates him! He's way better than the other Hoenn starters, he learns a bunch of epic moves naturally, and he looks plain awesome. All around, he's pwnage! I dun get it. i gonna go with cyndaquil, he is a beast of a starter. so what if he's weak against ground and water thts why i have a wie variety type team. HEY! DO YOU LIKE YELLING? 'CUZ I LIKE YELLING! WHILE WE ARE YELLING, I WANT TO TELL YOU THAT SAMUROTT IS THE BEST STARTER OF ALL-TIME IMO! I WOULD COMPARE STATS AND WHATNOT, BUT I JUST DONT CARE! SAMUROTT EATS EMBOARS FOR BREAKFAST WITH A SIDE OF BACON! Last edited by Haunted Water on Sat Jul 14, 2012 8:08 am, edited 1 time in total.